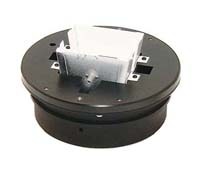 Accessory 35mm mixing chamber for Beseler and Beseler/Minolta #8289 (120V) and #8290 (230V) 45A Enlarger Light Source Colorheads. The 35mm mixing box is used for printing 35mm and smaller formats when additional light output is required. These mixing boxes are used, and have minor cosmetic marks from previous use, but are certified to be in perfect working condition. Note: This mixing chamber is specific to the 45A and cannot be used with other Beseler colorheads.